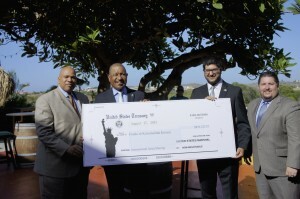 WILLEMSTAD - Today, James M. Doby, the U.S. Drug Enforcement Administration (DEA) Assistant Regional Director for the Puerto Rico Field Division and Hormazd Kanga, Acting Consul General of the U.S. Consulate General Curaçao, presented Curaçao Minister of Justice Nelson Navarro and acting KPC commissioner Albert Sambo with a check in the amount US $873,127.57 payable to the Government of Curaçao. The funds are 25% of the total assets seized during a money laundering investigation. KPC provided information to U.S. law enforcement about significant money flows to bank accounts in the U.S. related to a narcotics and money laundering investigation in Venezuela. In a letter dated June 2, 2014, the United States Attorney for the District of Puerto Rico concurred with the recommendation to share 25% of the forfeited assets with the Government of Curaçao.